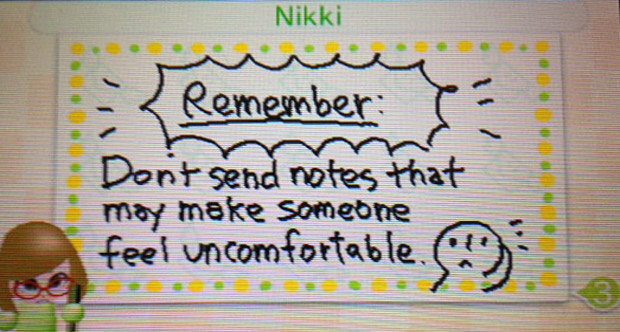 Swapnote was a simple 3DS feature which allowed people to share simple text notes and small images. The caveat was the Friend Code system: Only registered friends could share such notes. This was a protection feature to save kids from themselves, and adults from unwanted images. Playing Uno on XBLA with the camera enabled certainly proved how “flamboyant” online strangers could be when facing such a device. But, it would seem those safety measures were not enough. Kids were sharing Friend Codes online to send Swapnotes with what Nintendo calls, “explicit” materials. It would be best NOT to know specifically what they are referring to. As such, Nintendo 3DS’ worldwide began blinking last night to signify an inbox message. Said text stated the decision to immediately cease the online functionality of the app. Nintendo themselves often used the feature to send holiday messages, but it would seem those are no more. Swapnote is effectively useless unless you choose to use it locally, much like PictoChat on the DS, the feeble remains of a good idea turned sour.